No. 30, Jalan Perusahaan Sungai Lokan 3, Kawasan Perusahaan Sungai Lokan, 13800 Butterworth, Penang, Malaysia. 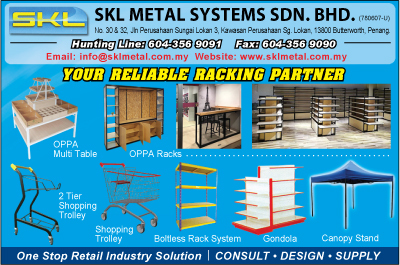 Established in 2007, SKL Metal Systems Sdn. Bhd. 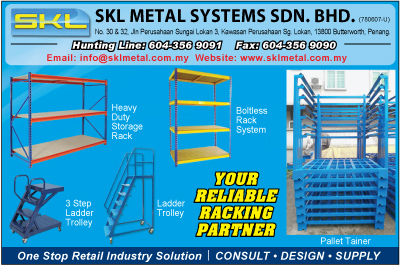 is the best in class and quality racking system provider for wide range of products such as heavy, medium and light duty of racking systems, gondola shelving, boltless racking systems, steel platform, mezzanine floors and etc with excellent quality, unique design and practical functions. In this growing business pace, we always believe in high effect and super quality in order to meet the ultimate requirements and satisfaction of our clients. Our goal is to exceed the expectations of every client by offering outstanding customer service, increase flexibility and greater value, thus optimizing system functionality and improving operation efficiency. We are maintaining and supplying our clients in MALAYSIA as well as ASEAN countries with our 1st class products. Meanwhile, we provide our service in various segments such as industrial warehouse, hypermarket, office and etc. We trust that our teams are skillful enough to build the racking system according to the client’s details and prototype. We expect to cooperate with our value client and discuss with product detail together. A professional assigned people will also responsible for your order to assuring that we fulfill what you need. Your support is the most powerful motivation for us. We would like to be your loyal and long-term business partner sincerely! 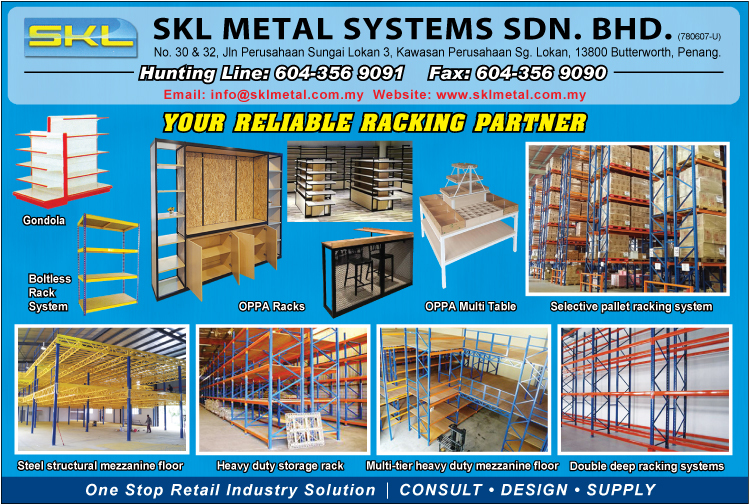 Our company has strong sales and technical team with vast experience in the design of cost-effective storage racking systems for maximum space utilization. Satisfaction is definitely guaranteed. We have delivered on its promise and reputation of providing a professional, customer orientated service and exceptional value for money. Backed by experience and expertise, we are your one-step solution for all your storage requirements, whatever you wish to display, we will be able to provide you with the equipment that you require!